With the changing leaves and falling temperatures, there's no doubt that fall is here! As mothers, we always try to stay a step ahead of the chaos and this month we're taking some time to share our thoughts on holiday celebrations, family traditions and maybe some new ideas about how to enjoy the upcoming season. So grab that cup of cinnamon-spiced coffee, prop your feet up on a pumpkin and enjoy what our writers have to say this month. ~TMC My husband and I have enjoyed establishing our family and getting to talk about different traditions we bring from each side, as well as what new traditions we want to begin with our children. There are two main activities we have decided to make a part of every Christmas celebration. The Advent Calendar is something that neither of our families ever used growing up, but Andy and I have enjoyed making it a part of our Christmas the last two years. There are so many you can choose from. I opted for making ours. I sewed 24 draw-string fabric pouches to allow myself plenty of variety. I also made 24 magnets with different Bible passages that together tell the Christmas story. Every year, I also buy 24 little treats. So far, I’ve only used candy, but since Gabriel will be old enough to enjoy opening the pouches this year, I’m also going to include little gifts for him—stickers, balls, homemade treats. Every morning, starting December 1st, we go to the basket with the pouches. We take the pouch for the day, open it, read the passage from the Christmas Story, place it on the fridge, and enjoy the little “treat.” It’s a very small part of our day, but it’s a neat way to make the Christmas joy last longer. We enjoy a little gift each day, while remembering the greatest gift in our lives, as well as so many blessings we can’t even name them. I hope this is something we continue every year with Gabriel—that he will look forward to that anticipation that is so precious in children, and that we as adults tend to forget sometimes. Hope is a beautiful virtue that we can instill in our children, and when we hope in truth, it will never disappoint. 2. Get a gift, give a gift. Another tradition that we hope to establish once Gabriel becomes more understanding of his possessions is to have him choose a toy to give away at every birthday and Christmas. We hope to find an orphanage, toy drive, or other donation means by which our children can learn the joy of giving to others in need. For adults, we have so many means by which to give—finances, time, a meal from our kitchen. For children, they really only have the gifts they receive as a means to give in return. We hope to encourage our children to choose one gift to give away every holiday. We would love to even encourage sacrificial giving—maybe even a favorite toy, or one that we know a child in need would really enjoy. We hope this will help balance the mentality of only “getting.” This will also help cut out all that accumulation as well J.
We’re still adding to our list of traditions! What ways are you intentional during the holiday season? The holidays can be such a hectic time and we as mothers shoulder much of the responsibility for decorating, baking, shopping, costume-making, hostessing, among many other things. We are goaded by commercials and sale papers to buy, buy, buy to make the perfect house and have happy children. We walk into stores and are bombarded by sales encouraging us to buy generic gifts that no one needs or just one more cute decoration we never knew we needed. We spend money we don’t have, use time we don’t have and end up feeling burnt out and unable to really enjoy and rest. I would encourage you to think about all the things you tend to do for various holidays. Then think about what each of those holidays actually means to you. What you are trying to communicate to your family through all the activities you do? Does decorating make you feel invigorated and your family feel blessed? Then do it! Is it a burden to you that makes you feel overwhelmed? Then don’t feel obligated to do it or do less. Does the idea of making another Thanksgiving turkey give you a panic attack? Then ditch it and make something you enjoy making that your family enjoys eating! Build in time to be with your family and friends to reflect on what each holiday really means to you. Find activities that point your children to the meaning of the holiday and encourages giving and generosity and a focus on others. Last year our family began using a Jesse tree as an advent activity. 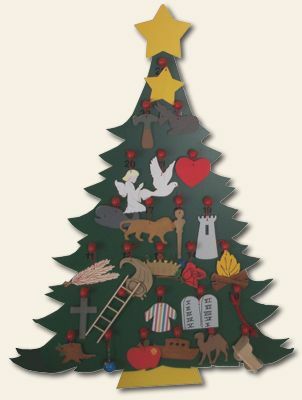 Each day for the month leading up to Christmas, we read a different Bible passage related to the coming of Christ and hung an ornament on the tree that stands for that passage. It was a great way to keep us centered on the true meaning and doing it each day provided a built in time for reflection, a moment of rest, as well as time together. Simplifying your holiday activities to ones that really mean something to you and are a blessing to your family help to make the time more meaningful, reflective and restful—as it is meant to be! With the changing leaves and falling temperatures, there's no doubt that fall is here! As mothers, we always try to stay a step ahead of the chaos and this month we're taking some time to share our thoughts on holiday celebrations, family traditions and maybe some new ideas about how to enjoy the upcoming season. So grab that cup of cinnamon-spiced coffee, prop your feet up on a pumpkin and enjoy what our writers have to say this month. ~TMC Can I share a secret with you? As self-centered as it sounds, I never really gave much thought to how my children would experience the holidays. I just assumed they would celebrate the same way I did. Yet as Halloween ushers in the holiday season, I am aware of just how different Miss E's experiences are going to be than mine. One of the reasons is: I didn't take into account my husband and his traditions. Of course I started thinking about holiday traditions while we were dating. His family does Christmas differently than mine, not to mention Thanksgiving. Yet it really wasn't until Halloween last year that I realized just how different our experiences were. Growing up, my family was very religious; church on Sunday, as well as, Tuesday, Thursday and any other day special services were held. Our church was very strict compared to some of the churches I've visited today. Women didn't wear pants. Jewelry, make-up, dancing and movie theater-attendance weren’t allowed. And Halloween, well Halloween was definitely a holiday we did not celebrate. I remember last year, I was pregnant and in between trick-or-treaters, my husband talked about what his family did. He talked about carving pumpkins with Miss E and what we would do for her first trick-or-treating. I usually have a plan, but in this I had no clue. I explained to J-man we didn't do Halloween in my house. I explained I only went trick-or-treating once as a child. Most of my childhood Halloweens were spent in church. At first I was a little saddened by the thought that Miss wouldn’t get to celebrate her first holidays the same way I did. I remember Thanksgivings spent at the homes of family filled with lots of noise and even more food. Our big Christmas celebrations were held on Christmas Eve, with carols being sung and filled with family fun. Christmas mornings were filled with visits from my Abuelo and my cousins who lived upstairs, and the evenings spent at church watching, or participating in, the Christmas play. I think even though there are many things from my childhood I want to share with Miss E, I know that they aren’t all possible. Things like getting together with family for the holidays is not going to be as easy as it was for me growing up. Both our families live out of state. As I get a melancholy feeling at the holiday celebrations Miss E will not know, I remember that as my cousins, sister and I grew up, my family’s traditions changed. Their holidays are no longer spent the same way they were when I was young. As I typed that last sentence I realized the important thing is that we, J-man, Miss E and I, are starting our own holiday traditions as a family. So this year, with Halloween quickly approaching, I can’t help but think how Miss E’s Halloweens will be filled with jack o’lanterns and costumes, and you know what I’m quite okay with the difference. I was even excited when my husband and I bought her first pumpkin carving set, since I'm sure pumpkin carving will become one of our family traditions. Are there traditions you followed as a child that you haven't carried on with your own children? Do you miss those traditions or are you happier with your new ones?